What would you call a place that offered great wine tastings, tours, music, a beautiful garden and even some pet friendly events? No, I haven't discovered Nirvana. It's Oliver Winery in Bloomington, Indiana I'm thinking about. I visited it with Travel Media Showcase and was thrilled with both the beauty and the fruits of the vine found there in equal parts. Oliver Winery began as a dream of Indiana University law professor William Oliver. It started as a hobby in his basement. 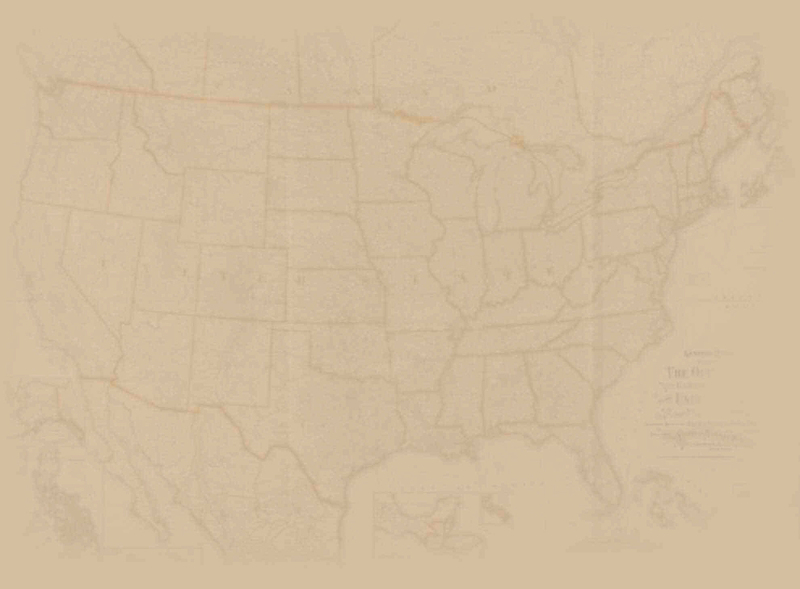 Then it became the first Indiana winery and grew to be the largest winery in the state. William Oliver's passed away in 2011. The winery continues in the competent hands of his son Bill and his wife, Kathleen. The first thing I noticed as we pulled into the drive to the winery was the garden. Wild, whimsical, natural, beautiful, punctuated with giant limestone sculptures and filled with secret places, it was a delight to the eye. I had to wander through it a bit before I entered the winery. 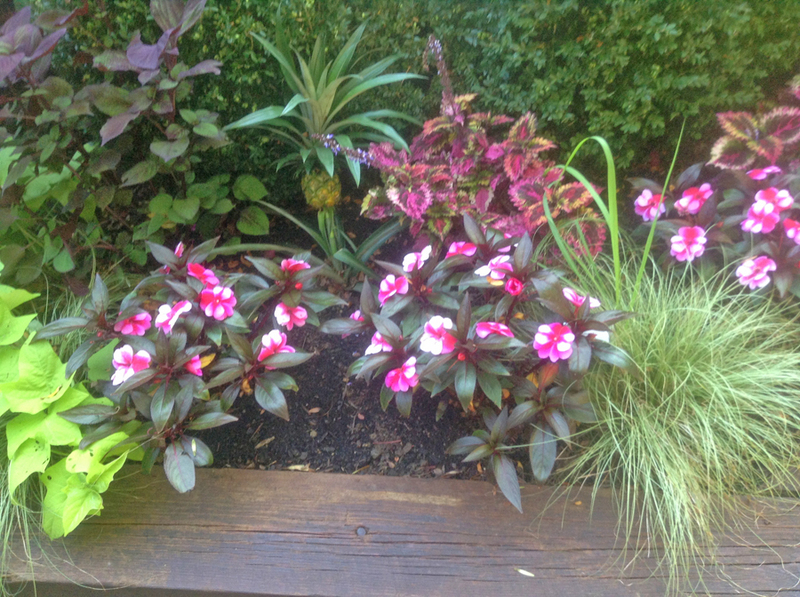 Flowers were planted amid trees and bushes. The limestone stood guard over it all. 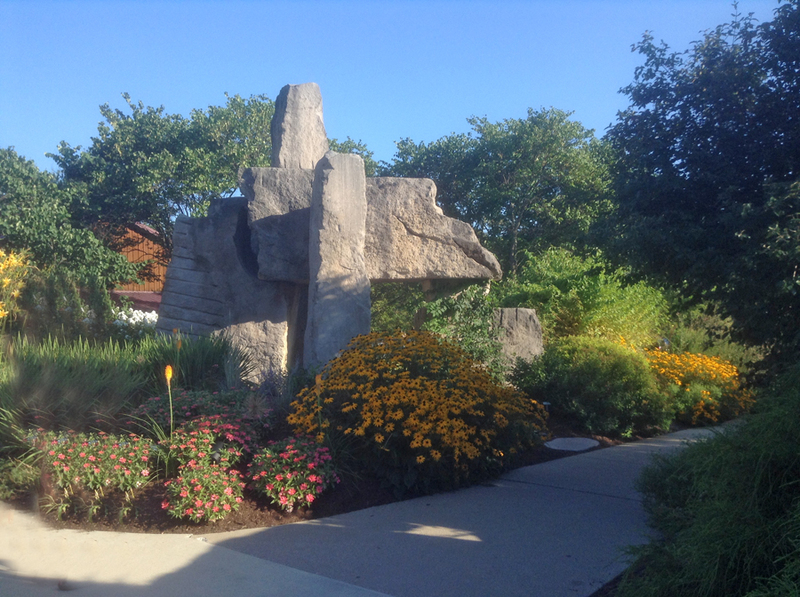 These magnificent sculptures were created by Indiana artist Mark A. Wallis especially for Oliver Winery in 1990. At one point clusters of what looked like inpatients stood next to a much larger patch of black eye susans. Around them were a variety of bristly grasses and assorted bushes. To the rear, small trees created a private grotto feeling. In the midst the limestone sculpture arose. It resembled a primitive castle with towers, yet totally rugged as nature provided it. 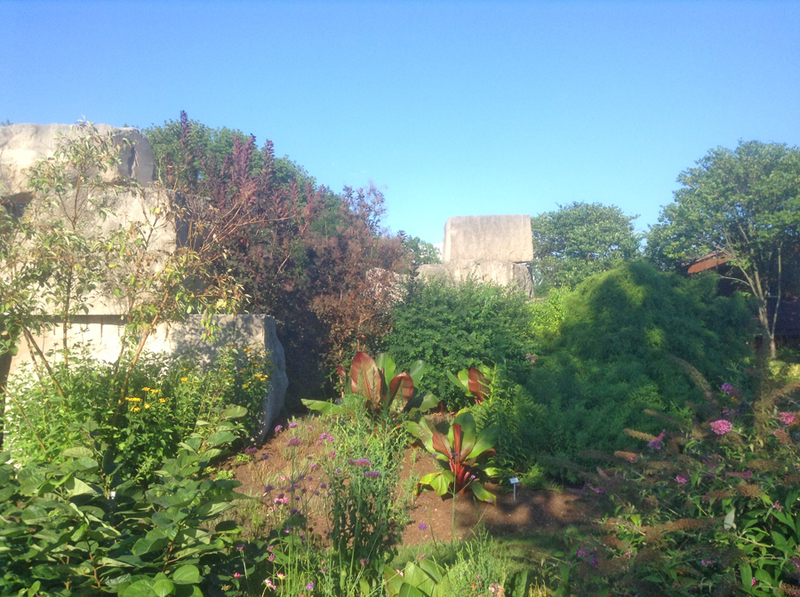 At other points, single spires of limestone arose amidst the plantings like a solitary piece of Stonehenge. 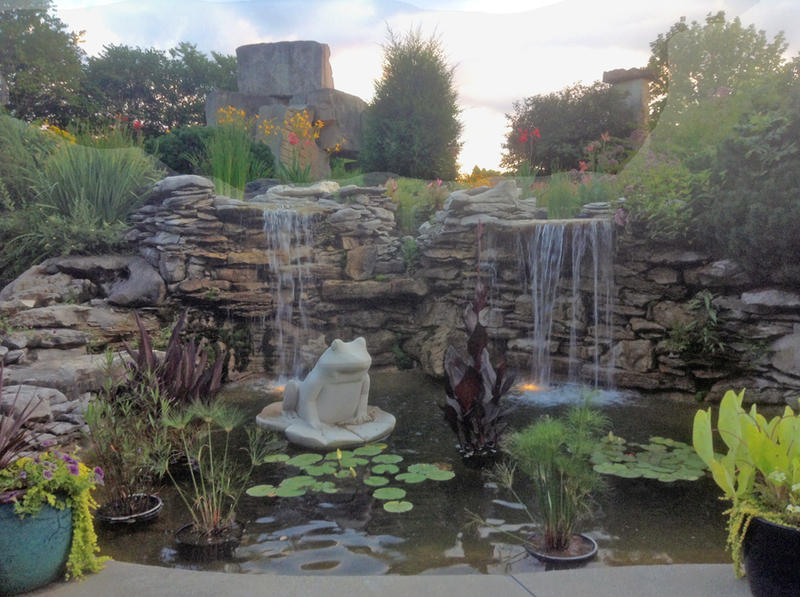 Nearer the main building there was a waterfall tumbling down stacked slabs of limestone into a pond decorated by a whimsical frog atop a lily pad. I entered the excitement of the winery far more relaxed than I had been when I stepped off that bus. Inside the building containing the tasting room and some of the production area including the aging barrels and winemaking vats the structure continued the feel of nature with its exposed beam ceiling and lots of wood. The winery had set up a banquet for us along with wine tasting stations. In the rear were a covered porch and a bandstand behind with musicians playing happy music. 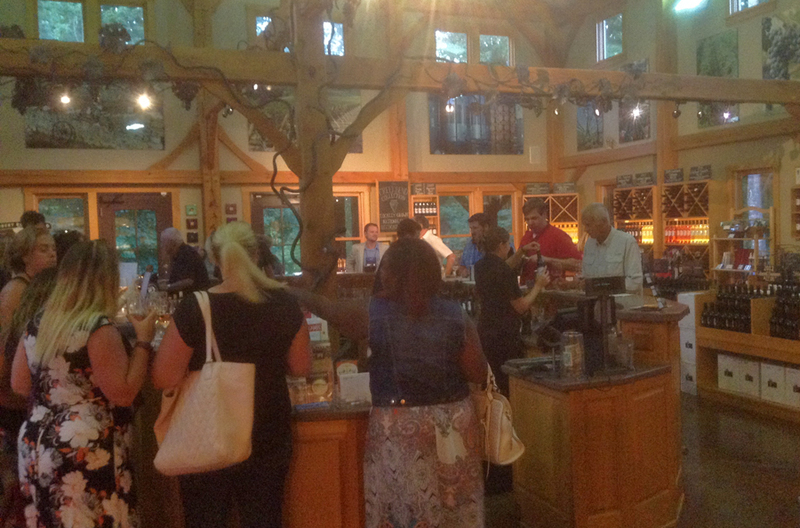 Happy visitors enjoying Oliver Winery wine. I sampled several of the wines. It was a hard choice between the Camelot Mead Honey Wine and Creekbend Catawba. Both are interesting wines in the semi-sweet range. I'm not a wine snob and love sweeter wines made from local grapes. The mead is something different. With its touch of honey and its ancient heritage, the mead is one of Oliver's trademark wines. It was the mix of peach and strawberries flavors that won the day for the Catawba with me. Catawba was the first wine grape in North America to be grown extensively for wine in the Ohio River area as far back as the 1800s. I really enjoyed the fresh fruity taste of this wine. My friends who prefer dryer wines found many that suited them perfectly. 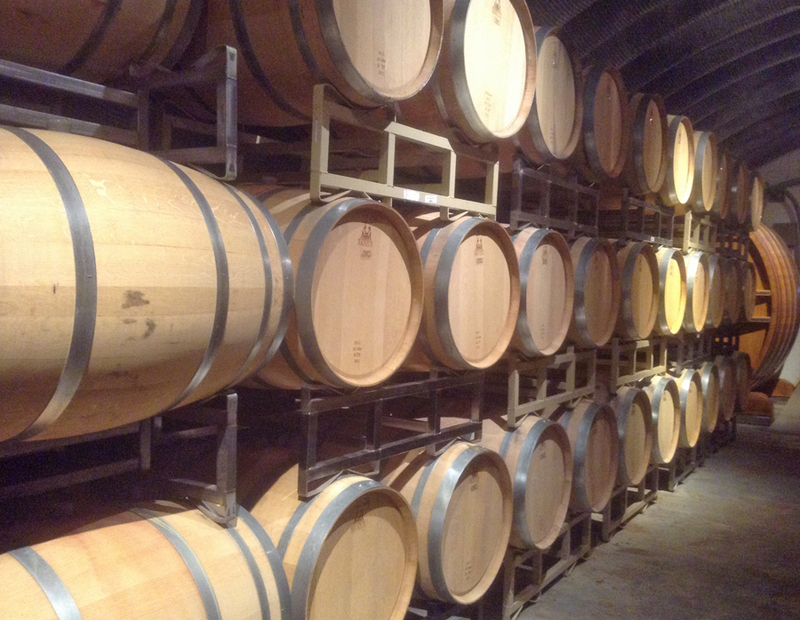 The Catawba for this wine much of the grapes used for the wine Oliver produces is grown in Oliver's Creekbend Vineyard. 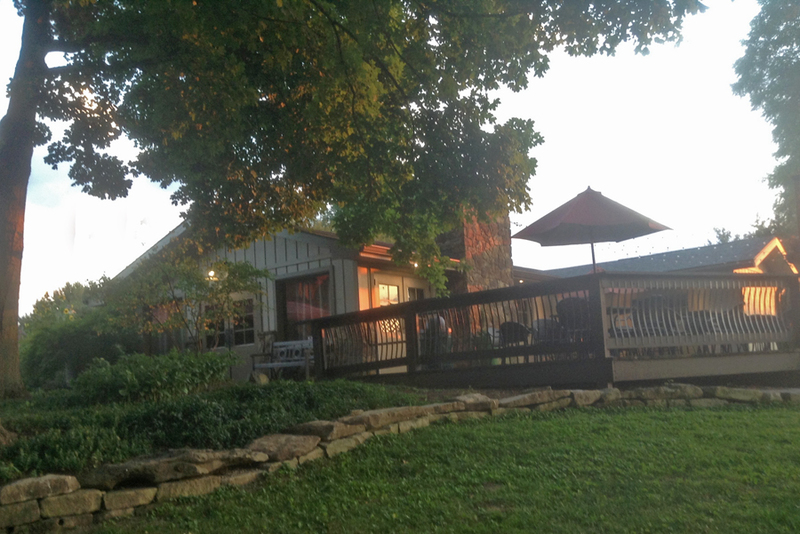 The vineyard is just a few minutes' drive away in Ellettsville. It was started in 1994 so that Oliver could produce grapes to meet their growing needs. Oliver hosts a Harvest Festival at the vineyard and numerous events such as Live Music Saturday and Bark and Wine to benefit the local animal shelter at the winery. 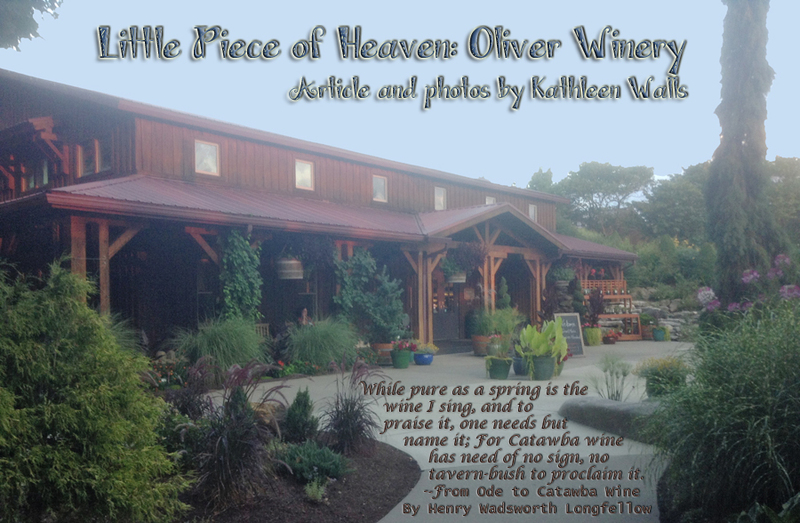 Catawba inspired the poet, Longfellow, to write Ode to Catawba Wine. One sip and I could understand his devotion. If he were alive today, I am sure he would enjoy visiting Oliver Winery. Ads fund American Roads and Global Highways and Global Highways so please consider them for your needed purchases.